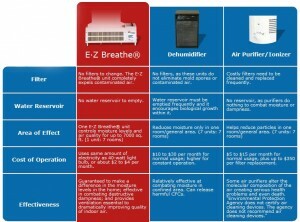 Energy efficient: Costs less than $2-4 per month to operate E-Z Breathe: The efficient choice for a moisture-free healthy home. Maintenance free and easy to operate with no filters to change or buckets of water to empty. Versatile: EZ Breathe is used in full basements, slabs, crawl spaces and garages. The E-Z Breathe System is a maintenance free unit that helps protect your home and family from excess moisture, molds, toxins, allergies and poor air quality resulting in a cleaner, healthier living environment. 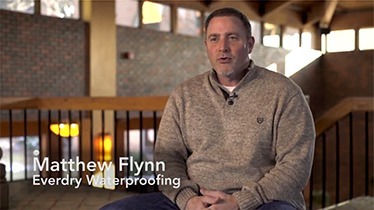 It provides powerful ventilation, supporting both the EPA and the American Lung Association’s recommendations to use a ventilated system to reduce indoor air pollution. 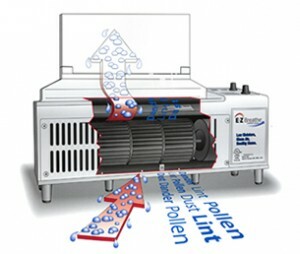 The EZ Breathe unit itself is a quiet, unobtrusive apparatus that fits easily into any room in the house. With no water or filters to change, it requires no on-going time or attention. With its energy efficient design, it requires very little power and no additional investment. 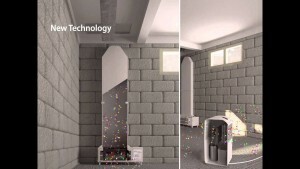 It is a truly revolutionary approach to home ventilation.